What is the best air compressor oil? Just as a motor vehicle manufacturer will specify types and grades of lubricants to ensure optimum performance and maximum protection for the engine, so every type of compressor needs a specific lubricant. Brian Barnes from Atlas Copco outlines air compressor oil and additive properties and their functions: to seal, cool, clean and reduce wear. He explains how the choice of lubricant depends on the equipment and its application, and the relevance of the ambient conditions, flow patterns and maintenance intervals. What makes air compressor oil special? Compressor lubricants comprise a base oil stock and specific synthetic, semi-synthetic or non-synthetic additives. Apart from providing lubrication and heat absorption, lubricants prevent corrosion, contamination and premature wear. The balanced mix of additives tailors them for the equipment requirements and the ambient conditions. These additions imbue the lubricant with properties such as oxidation resistance, viscosity at low temperatures, air release capability, demulsification, anti-foaming and anti-wear. Anti-oxidant additives delay the oxidising process, as well as the formation of acids. They increase lubricant lifetime, protect equipment during standby periods and increase lubricant compatibility with a wide range of operating conditions. Surface activity additives optimise anti-foaming. When large air bubbles – above 1 mm diameter – in the lubricant/air flow rise to the surface, they produce foam. Foaming increases oxidation by exposing more of the surface area of the oil to oxygen. Without these additives, excessive foam will saturate the oil separator, decreasing its lifetime. A saturated oil separator will create an increased pressure drop; every 1 bar pressure drop increases energy consumption by 7%. Oil demulsification additives are designed for improved water separation, to protect the system from water/oil emulsions. This priority makes subsequent oil capture in oleophilic bags easier, and improves condensate disposal procedures. 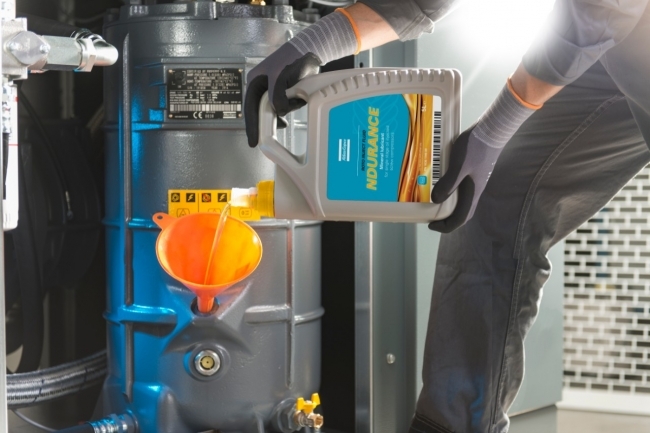 Equipment users may ask ‘What’s wrong with using a generic lubricant?’ or ‘Can I use motor oil in my air compressor?’ But air compressors are mechanically complex machines, often required to operate in challenging conditions. That is why leading equipment manufacturers of compressors, in close collaboration with oil companies, apply extensive research, testing and expertise to developing unique additive packages designed to meet all the demands of their product solutions. In contrast, generic lubricants are produced for a broad range of unrelated equipment with undemanding lubrication requirements. As such, they will lack the essential properties to achieve optimum performance of air movement equipment. Users should also be aware that there are suppliers within the industry releasing lubricants, without specific selection properties or type testing, that lack any established link between oil design and compressor performance. What is the risk of choosing the wrong type of lubricant? The incompatibility of the wrong lubricant can shorten equipment lifetime, encourage formation of deposits within the oil circuit and on moving parts, and provide insufficient lubrication of vital features. Also, to be considered is the interaction of the oil with other equipment items. A non-genuine lubricant may degrade the sealing function and lead to corrosion of metal parts, seriously affecting the performance of the equipment. The full grim picture of oil/equipment incompatibility should encourage users to follow manufacturers’ recommendations. The wrong choice of lubricant can mean shorter lifetime or even failure for bearings and oil pumps, as they will not be lubricated according to the specification. With an oil circuit full of deposits, there will be increased internal pressure and moving parts will not work properly. Ultimately, not only can this result in increased energy consumption but, in a worst-case scenario, it poses the risk of element failure and total breakdown. One of the most important factors in any maintenance schedule is recognition that extending oil life beyond specified oil drain intervals risks the problems associated with oil ageing as a result of temperature, humidity and dusty environments. High temperatures accelerate the rate at which the oil reacts with oxygen. Peroxides and radicals will be produced and cause formation of acids, varnish or sludge. Sludge, composed of large agglomerations of oxidised oil, metals and other impurities, attaches to the oil circuit causing malfunctions such as clogging of filters and oil separator elements. Hot conditions encourage additive and base oil decomposition, such as polymerisation where smaller fractions of the base oil stick together, resulting in higher viscosities. At very high temperatures, thermal cracking of the oil can occur, and volatile fractions of the base oil will escape into the atmosphere. High humidity also ages oil. The rate of oxidation is accelerated by water, as it will act as a catalyst and react with base oil and specific additives. Water will attack metal components which, in turn, will also act as a catalyst. Trying to extend oil life by running equipment longer than the specified oil drain interval adds to the risks associated with oil ageing. Choosing the right oil is not just a matter of taking an existing lubricant off the shelf. It means tailoring the characteristics of the lubricant to the needs of the oil circuit. That could be the high-volume oil requirement of open-circuit, oil-injected machines which are subject to high humidity and dust. Equally, it can apply to the higher running hours of closed-circuit oil-free equipment subjected to greater loads. For the compressor user, each combination of equipment, application and conditions is unique. 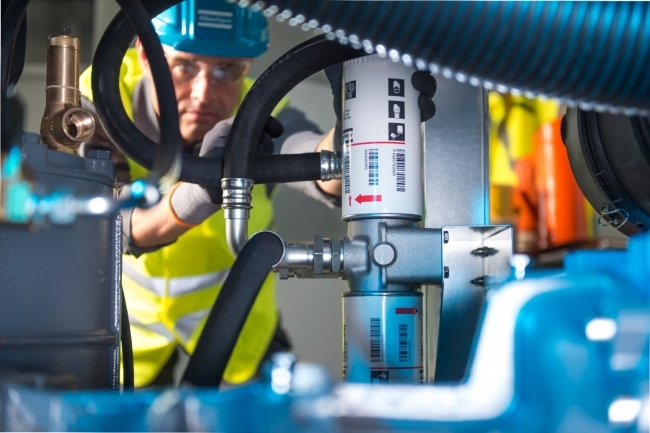 To ensure the best performance and reliability of the compressed air system, it makes sense to choose the recommended lubricant and follow the equipment manufacturer’s guidelines.